White Chocolate Bunny Ears: Tune (Out)))side 2007 - the Wave Farm, July 7, 2007, Acra, NY. Tune (Out)))side 2007 - the Wave Farm, July 7, 2007, Acra, NY. 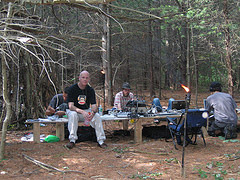 I felt very lucky to be included in one of free103point9's tenth anniversary events, the Tune (Out)))side 2007, held at the Wave Farm in Acra, NY. On this absolutely radiant summer day, the Wave Farm hosted live performances by over 30 sound artists. This was a headphone festival broadcast on 4 different frequencies. Each attendee received their own little FM transmitter and a printed program which listed all the performers and performance times. Performance stages were set up at various locations. One could wander the fields and paths through the woods to visit various stages or just camp out and switch between channels. I was in a group of sound artists that I've become acquainted with from previous performances associated with Phonography. Think of "phonography" as being analogous to "photography." We capture sounds from the world around us and present them back as they are, unedited and "unretouched." Taken out of their original context and reproduced without a visual component, the recordings reward the listener with a rich auditory experience. Being primarily a visually oriented culture, we tend to focus our attention foremost on what can be seen, often actually "tuning out" what can be heard, let alone what can be listened to with attention. Purely listening, without the "picture," as it were, is still to many an unfamiliar way to experience the world, but we're trying to change that. Our stage was set up on a hillside in a pine forest, fairly removed from the action down on the field, reachable only by a 10 minute walk over a winding pathway. A generator humming in the distance provided us with the power for our laptops and mixers. The ten of us took turns keeping our channel live for 6 hours, as we played raw field recordings, digitally processed field recordings, and a final, "anything goes" set. We finished in the dark, up on our mountain base camp, surrounded by the flames of tiki torches that gave us our only illumination and helped somewhat keep the mosquitoes away. Because I was pretty intently focused on what I was doing, along with the others in my group I didn't hear too much of what was playing on the other channels. However I did spend time listening to Elliot Sharp and Shou Wang's guitar duo, which was as pretty as diamonds dropping on a glass floor. I also enjoyed seeing Edmund Mooney, Jonny Farrow and Andrea Williams do their sound experiments in clean suits. They were the only artists who brought a theatrical element to a performance. They went about taking notes on each other and measuring things in the weeds. I think one of them even checked me for radiation. They let me go. I set up a flickr page of some photos of the event. Please visit here to learn more details about this particular event. free103point9 is an amazing resource for artists and listeners. Galen Joseph-Hunter and Tom Roe have an ever expanding and far reaching program for the promotion of transmission arts - read more about them here in Chronogram magazine.